Campers attempt to untie knots in a frozen T-shirt to win a spot at the front of the lunch line. 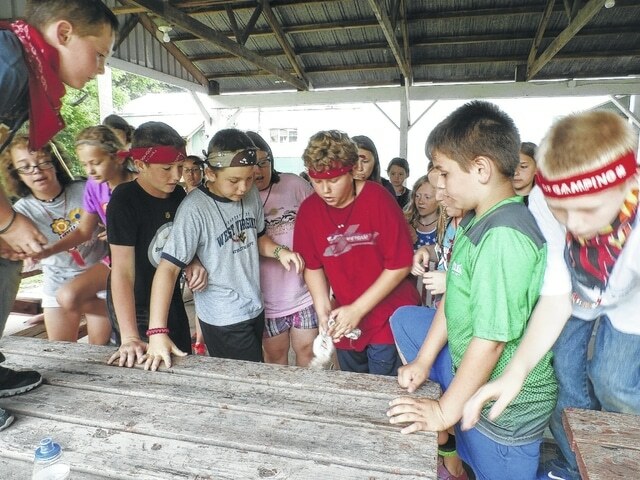 SOUTHSIDE — Summer is in full swing when campers descend on the Mason County 4H Camp. On Thursday, the camping season wrapped up as younger 4H’ers, ages eight to sixth grade, gathered around council circle for one last night of fun. Older 4H members were at camp the week before. About 170 children experienced camp this year. While at camp, 4H members play games and have fun, but they also attend classes that consist of everything from archery and creating survivor bracelets, crafts to science classes, wood shop, air rifles, photography, slate painting and more. In a time in which children have so many options in terms of how to spend their time, 4H camp remains a staple. In Mason County, 4H camp is a tradition for many families that spans generations. Extension Agent Rodney Wallbrown said camp remains both fun and educational. He also said this year is the 100th anniversary of 4H camping in West Virginia. Lorrie Wright, extension agent, said 4H camp also provides a spirit of diversity and acceptance. She said many children who attend camp many not interact with each other while in a public school setting. For whatever reason, 4H is a safe space to get to know fellow tribe members. And being in 4H is all about finding a tribe and learning how to get along, solve problems and celebrate who gets the “spirit stick.” The coveted “spirit stick” is given out at the end of camp to the chief of the winning tribe based upon criteria that includes who inspires, motivates, entertains and embodies the 4H spirit. An Extension camping instructor from out of the county determines who gets chosen for the award. This year’s ECI was Kirsten Reneau, of Taylor County, who spent the previous week at the state 4H camp. For those who want to relive the 4H camping experience, Mason County Alumni 4H Camp Weekend is July 10-11 and is open for those ages 22-122 at the Mason County 4H Camp. The event is a fundraiser for the new dining hall at the camp and will be the last time that the old dining hall will be used. The cost of the alumni camp is $50 to cover the cost of food, with all other proceeds going to the dining hall fund. Friday, July 10 camp starts at 5 p.m. followed by a tribal meeting with spaghetti dinner served, the evening will consist of council circle. Saturday, July 11 will consist of breakfast, lunch and sports and end with a dance. A silent auction will end at 4 p.m. Saturday, July 11 for the dining hall. No alcohol is allowed at the event, which is for adults only. Contact Lisa Arbogast for information and to register at lanurse66@yahoo.com; find Arbogast on Facebook; or call her 304-675-4506 or Linda Roush at 304-675-7293.